Everyone has a comfort food meal that they grew up on. Unfortunately, many of these meals are also unhealthy. With these tweaks, you can still enjoy your meal worry-free. 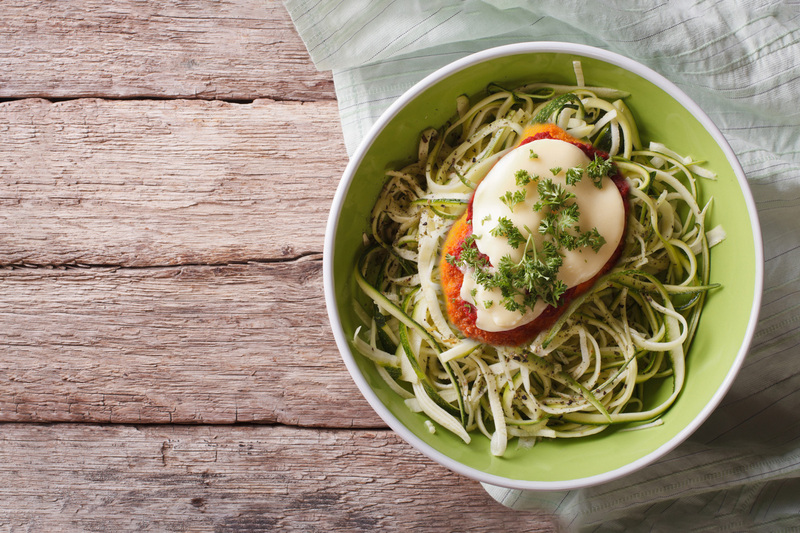 Today, we’re serving up a recipe for healthy chicken parmesan that’ll make your mouth water! Sometimes, you just need comfort food. What if we told you that you could still enjoy these meals and stay healthy? You’re in luck! Chicken parmesan is one of the most popular Italian dishes. Whether over pasta or as a sandwich, millions enjoy this delicious meal every day. For the health-conscious out there, they will recognize what goes into this dish. Fried chicken, red sauce, cheese, and pasta all make for a calorie-laden dinner. The biggest change you can make chicken parmesan is replace the noodles. Whole wheat pasta is one of the easiest substitutions you can make since it has fewer calories while containing more fiber, vitamins, and minerals. They are also available in most grocery stores. While you can go with whole wheat, there’s another choice that’s even healthier. Spaghetti squash has become a popular alternative to pasta in many Italian dishes. This low-calorie option mimics the taste and look of pasta and can be seasoned to taste how you want! After you’ve covered the pasta, it’s time to work on the chicken. One easy twist you can make is cutting the chicken breast in half. Another option is to use chicken cutlets. This has the double benefit of portion-control and ensuring the chicken cooks through all the way. The next step is seasoning the chicken. Usually, you cover the chicken in flour and spices before frying. Much like the noodles, whole wheat flour is an optional substitute. For a more creative touch, you can try substitutes like cornmeal, panko, or even crushed cornflakes. Each of these tend to be lower in calories and add a little something different to the chicken. Finally, it’s time to cook the chicken. Instead of frying the chicken, bake it in the oven. By baking the chicken, you’re cutting out much of the oil and grease that makes fried chicken so fatty. Preheat oven to 400°F. Cover two baking sheets with tin foil, and lightly cover with cooking spray to prevent sticking. Slice the spaghetti squash in half. Scoop out the seeds and loose squash strings. Lightly drizzle the inside with olive oil. Salt and pepper. Place open-side down on a cooking sheet. Bake for 30-40 minutes. Combine egg whites, yogurt, salt, and pepper in a large bowl. Add corn flakes to food processor and pulse desired texture. Combine with panko, garlic powder, salt, and pepper. Add shredded parmesan cheese to mixture for some extra flavor (optional). Set aside. Slice chicken breast in two even halves. Add chicken to the egg-yogurt mixture, and cover lightly. Dip the chicken in the cornflake-panko mixture, covering both sides. Place a baking rack on the other baking sheet, and add the chicken. The baking rack will allow the chicken to get crispy on both sides. Put both cooking sheets in the oven. Bake for 20-25 minutes. Check the chicken after 15 minutes and rotate both cooking sheets. When there are roughly 10 minutes remaining on the chicken and spaghetti squash, add 3 cups of marinara sauce to a small saucepan. Heat on the stovetop on Low. Stir occasionally until heated through. With 5 minutes remaining, take a small spoonful of sauce and lightly cover the top of each piece of chicken. Add a small pinch of parmesan cheese to the top of both pieces. Place the chicken back in the oven. When done, the chicken juices should run clear and the spaghetti squash should be easy to pierce. With a fork, scrape the spaghetti squash flesh way from the shell and add to a large bowl. Add most of the rest of the sauce to the spaghetti squash and mix thoroughly. Serve spaghetti squash on a plate, placing the chicken on top of a bed of squash.